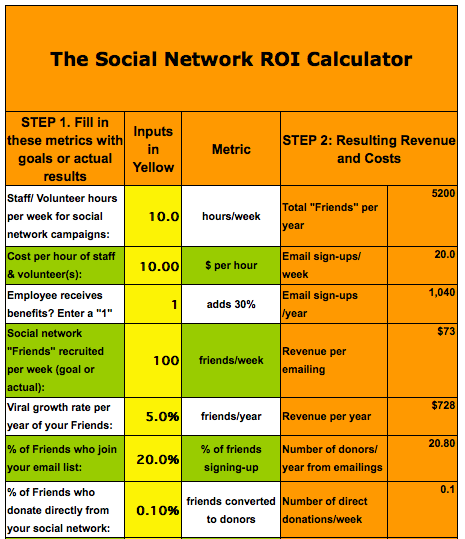 A couple of years ago I put together the "social network" calculator as a free resource to assess the opportunity cost of recruiting email subscribers and donors online. It was ahead of its time and may still need some tweaking, but the basic assumptions hold true - if you're paying staff to spend time on social networks and the end goal is list-growth or dollars, then this tool is for you. How does it work? After you access the calculator here, enter the cost per hour of your staff, and other basic web and email metrics, and you can get a realistic snapshot of how you're doing. I'll preempt the typical response of "well, there are other intangibles and other types of ROI" by saying that if that's your world, that's fine, you're right - there are interesting and good things that happen as a result of social media, and you should do it, but I wouldn't expect a lot of direct response in terms of dollars, and you might want to hold off if you haven't done some of the basics, first. And if you're going to spend time on social media, and you aren't leveraging your email list to do so, you're doing things the hard way. ROI (Return on Investment) in its simplest form has has a very specific mathematical definition. ROI = (gain from investment - cost of investment)/(cost of investment). That will give you a percentage that you can compare against other potential investments. You usually want to go with the highest percentage or percentages if you're making a decision as to where you spend budget. I think social networks have huge potential - but if you're being asked by your boss (or you're a boss asking your employees or volunteers) to do the near impossible, and beat the numbers, then this tool is for you. You can quickly see the actual cost per friend you recruit, the supporter you recruit, or cost per donation and hopefully compare that to other options - web traffic, direct mail, ads, email, events, etc. This tool was designed to assess OPPORTUNITY COST; namely, if you're spending time doing something with a lower return on investment than another opportunity, you should stop doing it and choose the investment with the higher potential return. So... let 'er rip. Bring on the peer review. I'm sure all you highly opinionated folks have a lot to say about this now that we have been watching the gold rush for four years NOT pan out to be the viral miracle we dreamed of early on for MOST nonprofits. It's time to bust out the calculator and have a realistic look. My hope is that people will help me refine this to make it a more user-friendly tool, and hopefully save the nonprofit sector millions of dollars. http://ow.ly/1XgIb or http://www.socialnetworkcalculator.com if you want to tweet it. (Ha! The irony). *Justin is the Director of Nonprofit Services at Care2.com.